You know.. 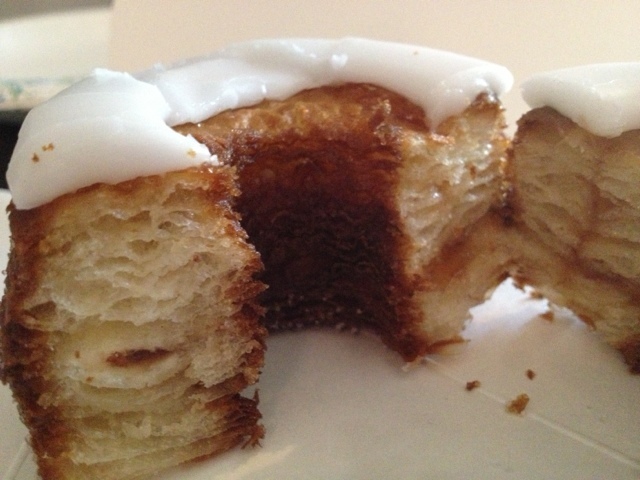 I find myself loving my job even more these days-- could it be linked to the appearance of yet another cronut? Yes, the infamous doughnut/croissant hybrid is still generating buzz in NYC-- especially in our office! 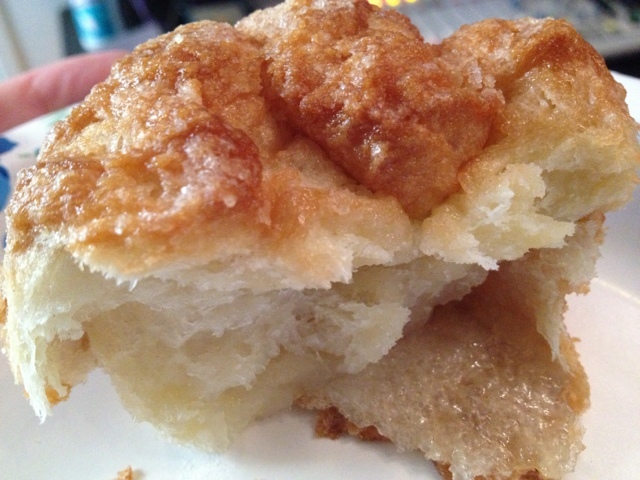 The same listener who brought us the Croconut last month brought the September flavor (Fig & Mascarpone cheese) today! The filling is a light fig preserve and mascarpone cheese (sort of a cross between sour cream and ricotta, or similar to a crème fraîche but not quite as tangy), topped with a honey glaze and dried black mission figs. It's a nice combo, but milder than I expected. The best part of the morning? This was not the end of our delicious dessert experience-- the listener also got us some DKAs, the pastry which first put Dominique Ansel on the map! 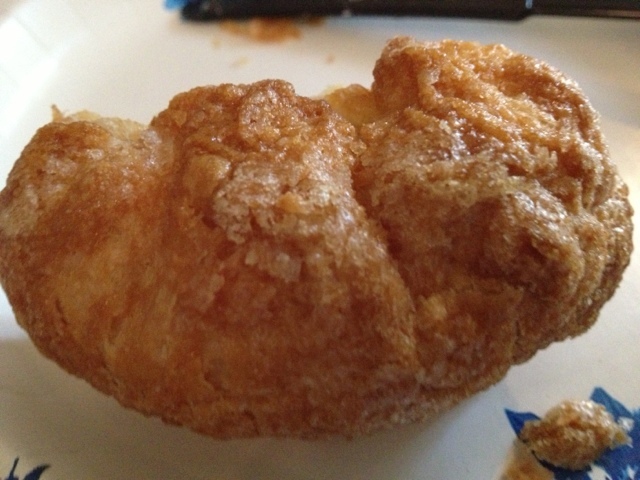 DKA, according to the store's website, is short for “Dominique’s Kouign Amann," and it is a smaller version of the traditional Breton pastry, which is similar to a caramelized croissant. The outside is crunchy, the inside is a bit chewy, buttery, and to me, cheesy (almost danish-like), and downright heavenly. 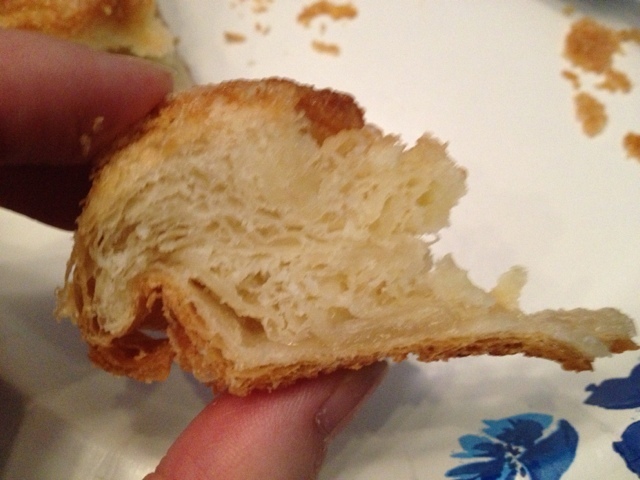 It might LOOK like an ordinary, plain roll or some other mundane munchie, but this DKA was phenomenal, and everyone there agreed that this far surpasses the Cronut in deliciousness. That's it.. time for me to head back to Dominique Ansel's shop to indulge my carb cravings. Who's with me??? I still want to get over there to try the frozen s'mores too. Maybe once we find out the October flavor, we will need a work field trip. Great post! 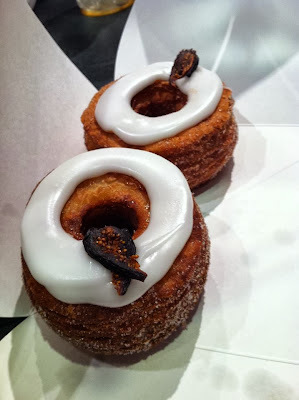 DKA was delicious, and dare I say, better than the Cronut.